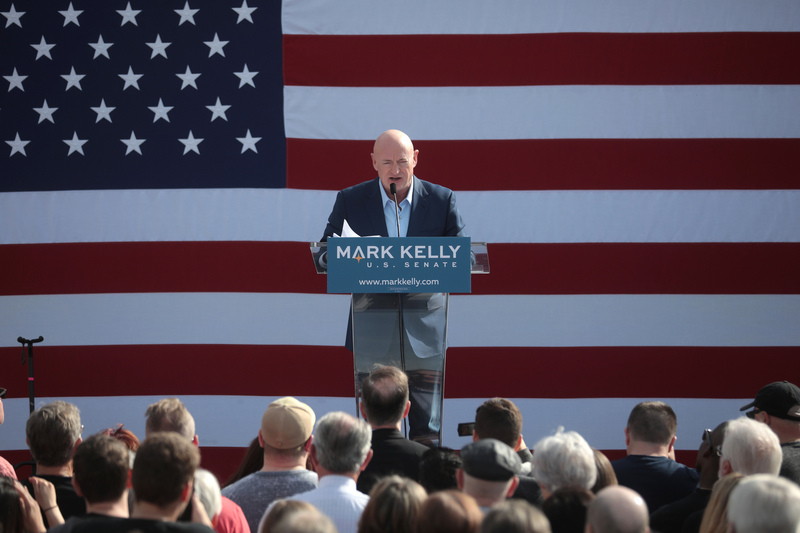 Now that Rep. Ruben Gallego has officially decided against a run for the U.S. Senate, all eyes are on the presumptive Democratic nominee, Mark Kelly. While most Democrats see Kelly’s run as positive, others are privately fretting about his number one enemy, the NRA. Mark Kelly can’t distance himself from the work he’s done in opposition to the powerful organization. He can’t pretend he hasn’t been a strong advocate for universal background checks. He can’t lie about the work his wife’s organization, Giffords, has done to keep guns out of the hands of domestic abusers. A part of his identity will always be tied to the students at Parkland and the parents at Sandy Hook and the millions of other survivors whose lives have been impacted by gun violence. But those connections should not be viewed as a weakness of his campaign. Though Kelly’s advocacy work is certain to initiate millions in NRA-funded attack ads, I doubt those attacks will have much of an effect on the race or give any kind of edge to Kelly’s challenger, Sen. Martha McSally. In fact, I believe the opposite is true. The conversation around gun violence is changing, and the NRA isn’t the all-powerful lobbying organization it used to be. True, it still has millions of members and an impressive war chest of donations. But it’s losing its position as the third rail of government. Instead of enjoying bipartisan support as it has in the past, Democrats are now actively shunning the group. New political organizations such as Everytown For Gun Safety and March For Our Lives are changing the narrative, successfully lobbying state legislatures and financially supporting their own candidates. But the NRA hasn’t simply alienated progressives and young voters. The organization’s opposition to basic gun safety laws and its willingness to make personal attacks against the survivors of gun massacres has also damaged its brand with a key voting demographic: suburban women. Suburban moms live with the very real fear of school shootings. They know what it’s like to have kindergarteners and high schoolers who are forced to practice active shooter drills. So many of these women are fed up with the politics of “thoughts and prayers” and are willing to cross party lines and support candidates who will actually do something to keep their kids safe. Here’s where Kelly comes in. Kelly needs suburban women on his side. This voting bloc made the difference in last year’s U.S. Senate campaign, when they broke for Kyrsten Sinema instead of McSally. That means if there was ever a time to fight the NRA, it’s now. And if there was ever a candidate perfectly suited to take on that fight, it’s Mark Kelly. Unlike many politicians, Kelly isn’t a political ideologue. He can’t be painted as soft on guns or dismissed as some East Coast liberal. The man is an experienced Navy combat pilot with multiple tours of duty during the Gulf War. He understands, appreciates and respects the power of weapons. If the NRA tries to attack him the way they attacked the Parkland survivors, calling him “soulless” or using their allies in the media to demean his military service or character, it will backfire because voters know better. Arizonans are already familiar with Kelly’s personal story. They recognize his views on gun safety are not the result of political expediency but rather a tragic personal experience, one that almost left him widowed and will forever impact his life and that of his spouse’s. In other words, Kelly comes by his beliefs honestly. And it’s his genuineness that will resonate with voters, including those who are gun owners. So, instead of wishing away Kelly’s connection to gun violence prevention, Democrats should be embracing it. Let the NRA make its attacks. Let Arizonans see the organization’s true colors. Not red, white and blue, but rather a deepening shade of green as it sinks further into the pockets of gun manufacturers. Kelly’s election could signal a turning point in the politics of gun safety. And that would be a win for the entire country.